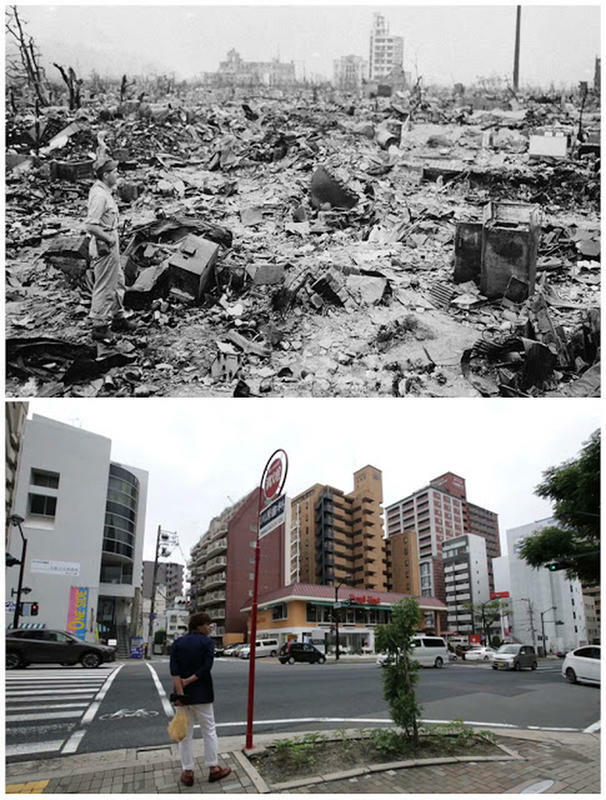 When the US dropped the atomic bomb on Hiroshima on August 6, 1945, it killed about 140,000 people out of the 350,000 who lived in the city. That was the first nuclear weapon to be used in war. After 3 days, another atomic bomb was dropped on Nagasaki. 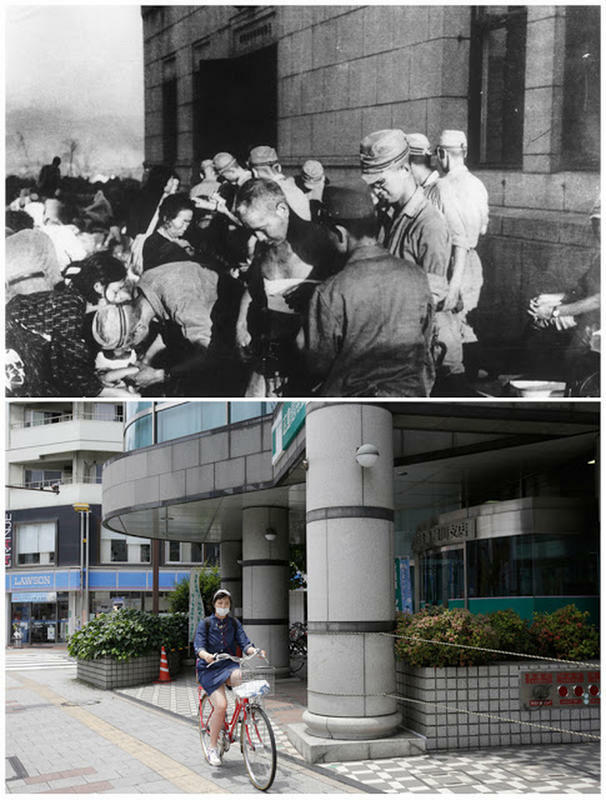 Here are 15 vintage photographs of the aftermath of the bombings in Hiroshima and Nagasaki, along with recent pictures of the same locations. 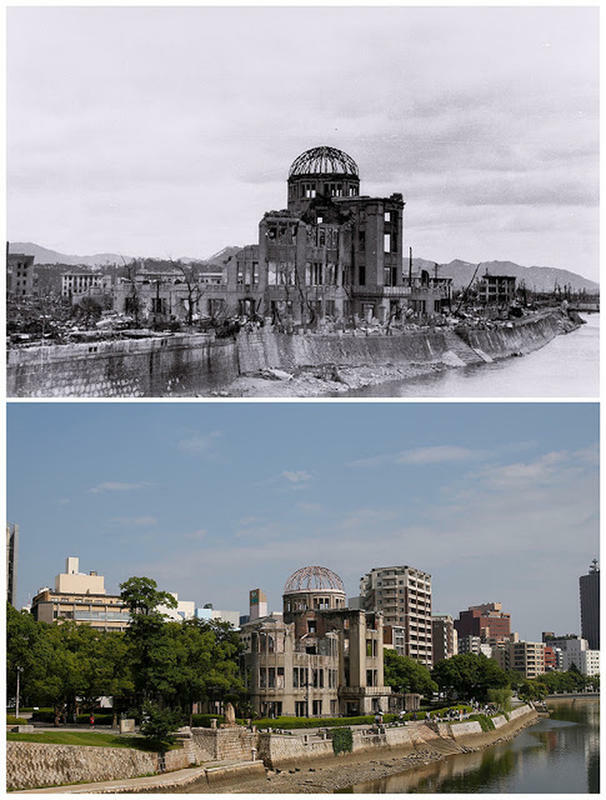 The Atomic Bomb Dome became a UN World Heritage Site, and considered the iconic image of Hiroshima. 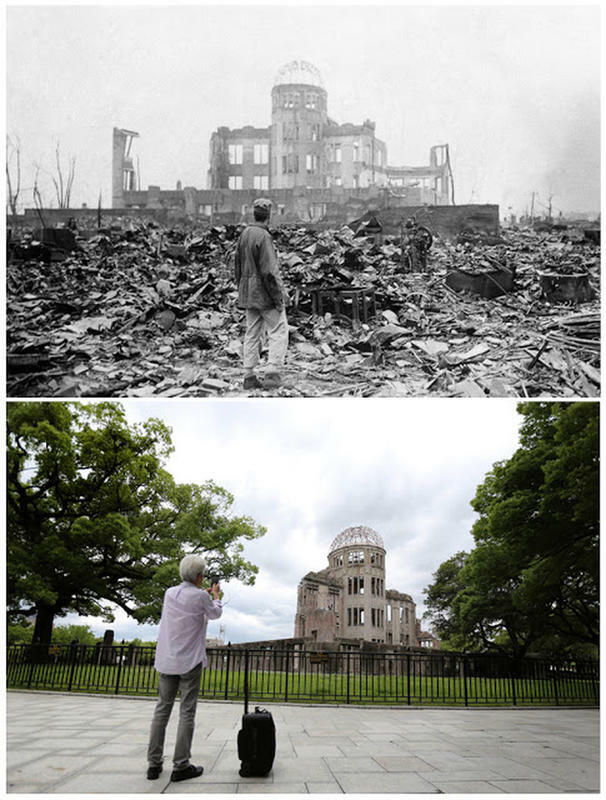 In this 1 July, 2015 photo, a visitor captured the Atomic Bomb Dome in Hiroshima, western Japan. 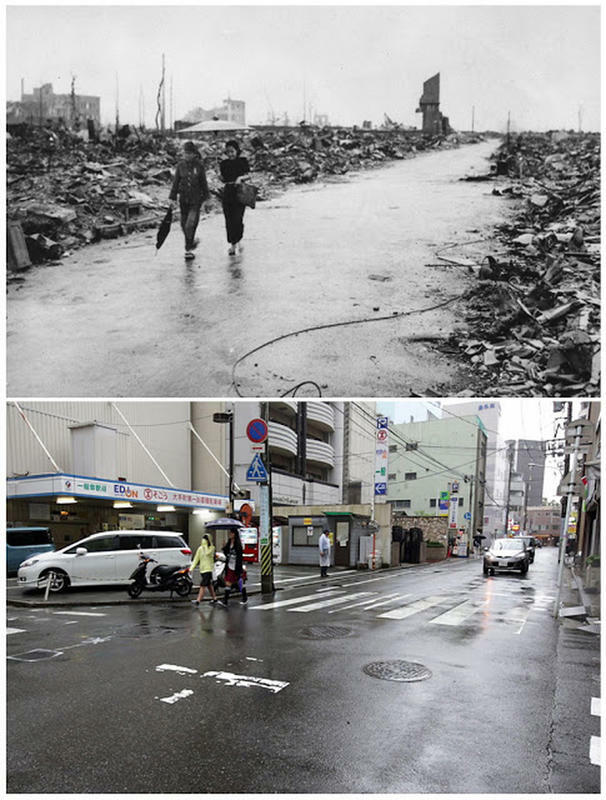 Two individuals walk on a cleared path along the destruction resulting from the 6 August detonation of the first atomic bomb released in Hiroshima, western Japan. A city, reborn, rose from the ashes, and is now a buzzing modern metropolis. The detonation instantly killed more than 60,000 people, with many thousand others dying thereafter from effects of the radioactive fallout. When the year 1945 ended, 140,000 more had died as a result of the bomb. 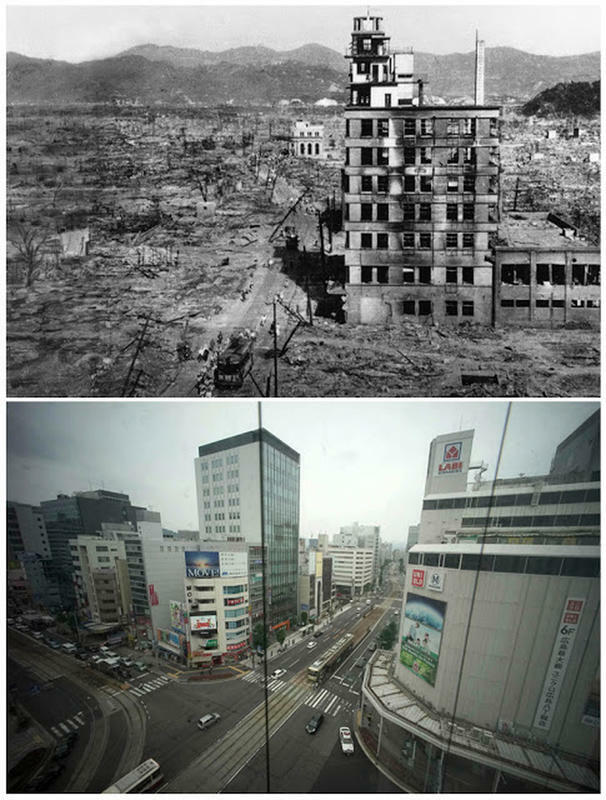 In recent years, the population of Hiroshima has increased to 1.2million. It was rumoured that nothing would flourish in the city, but during the next spring, the flowers started to bloom again - so people considered returning to the devastated city and rebuild. 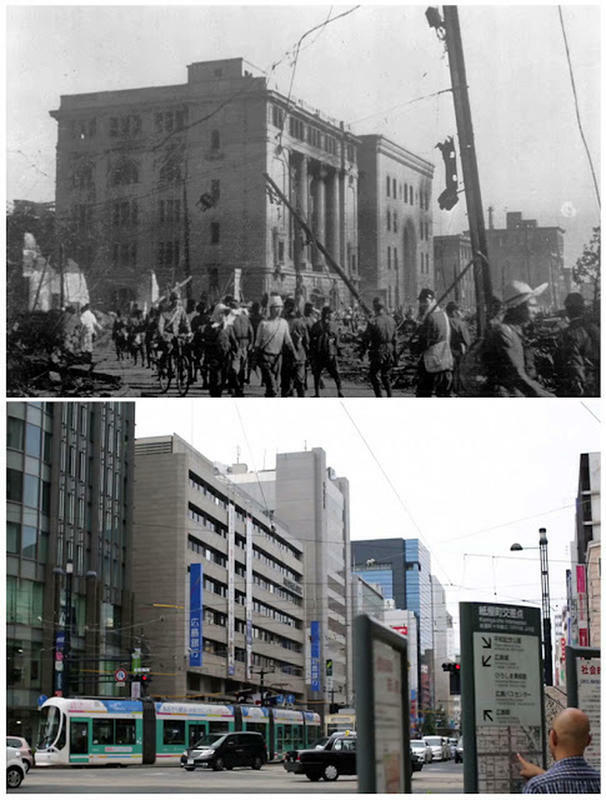 The gutted Hiroshima Prefectural Industrial Promotion Hall – known today as the A-Bomb Dome or the Hiroshima Peace Memorial – after the bombing on 6 August 1945, and the exact same location near Aioi Bridge in 2015. 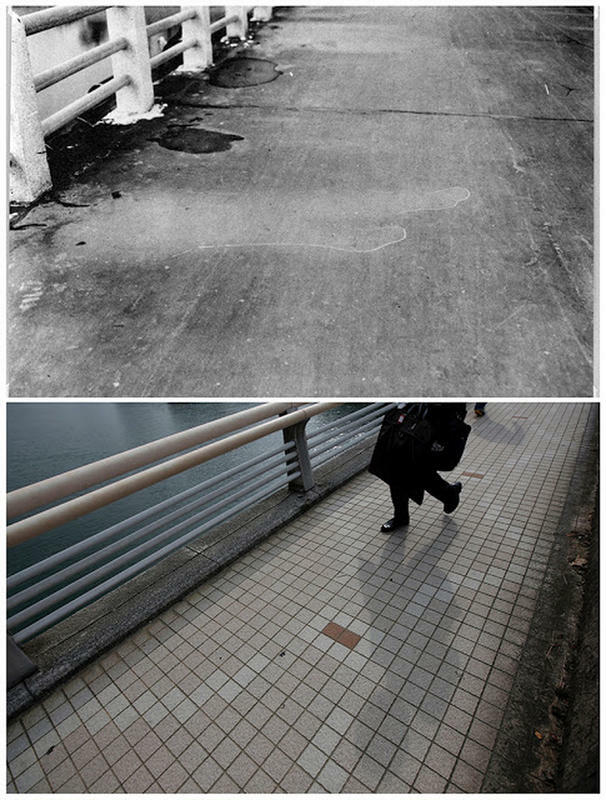 The etched outline of a passerby imprinted on the Yorozuyo Bridge when the heat of the bomb was over. This was 860 metres away from the centre of the explosion; the asphalt was charred everywhere except for the light area shielded by their body. Currently, the bridge has been tiled over. 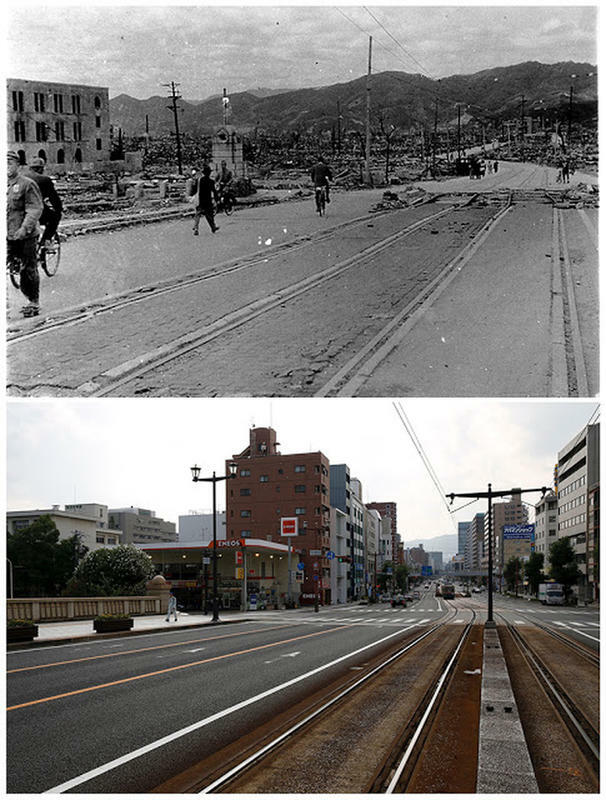 Residents walk near Aioi Bridge in Hiroshima, October 1945, and the bridge as we see today. 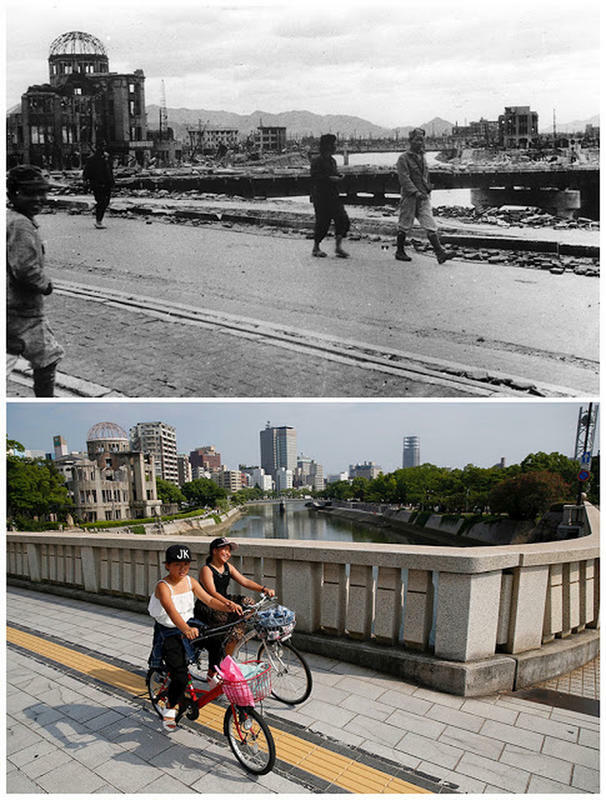 Individuals walk past the A-Bomb Dome on the Aioi Bridge. Nowadays, cyclists cross the bridge. 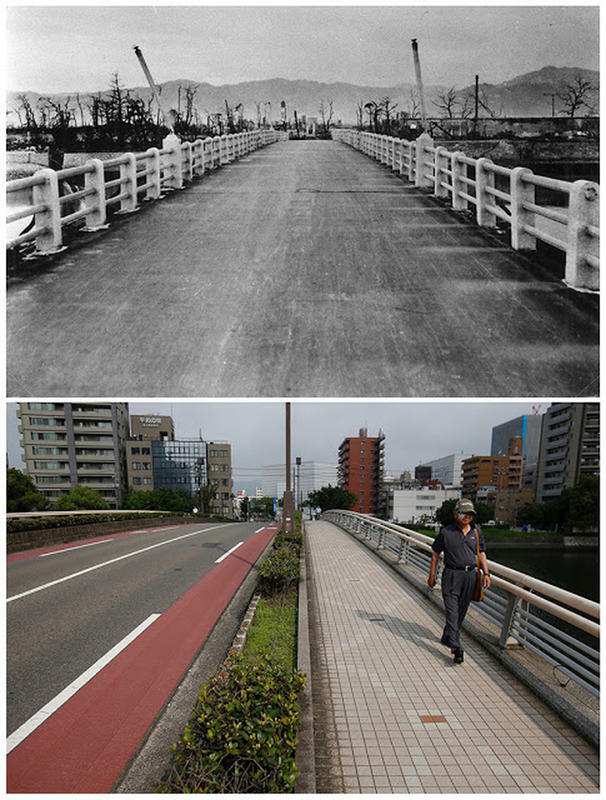 The shadows of railings radiate on the Yorozuyo Bridge road by the heat of the bomb. 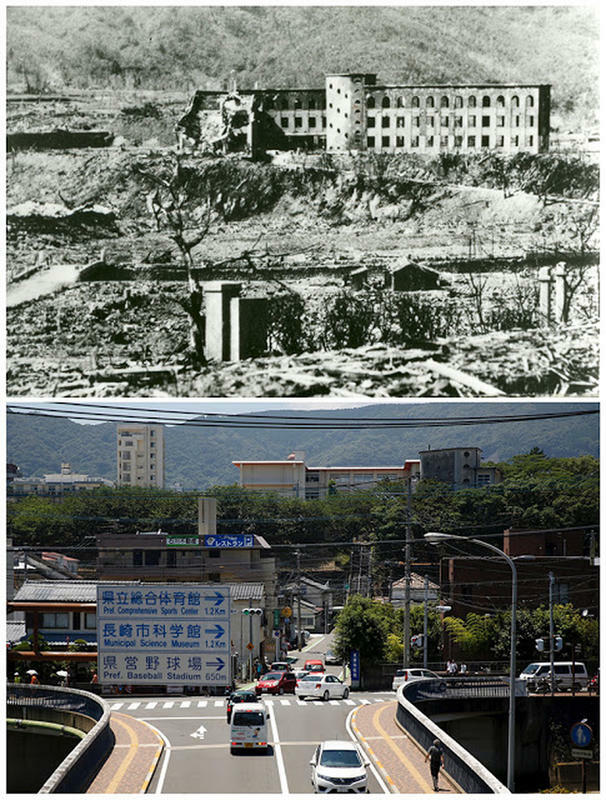 The ruins of Nagasaki Medical College building after the second bomb blasted on Nagasaki, three days later. 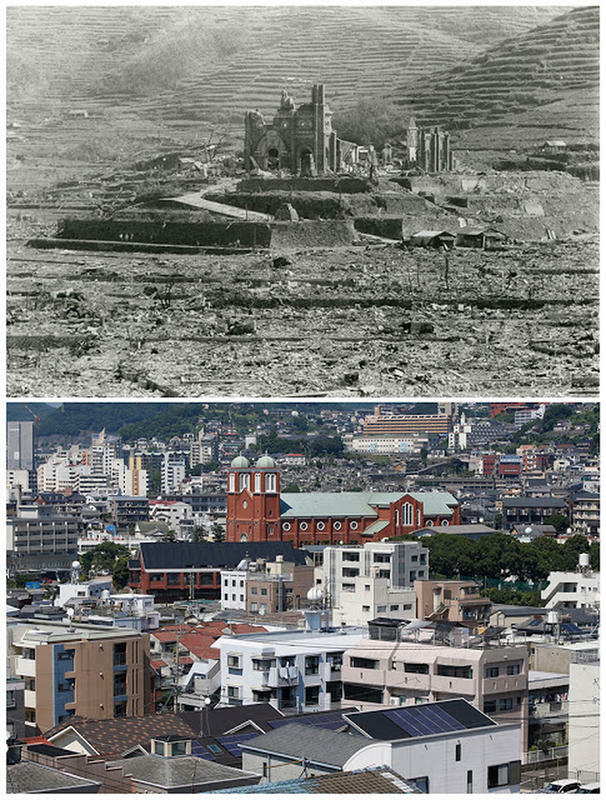 The Urakami Cathedral in Nagasaki obliterated on 9 August. It was rebuilt in 1959. 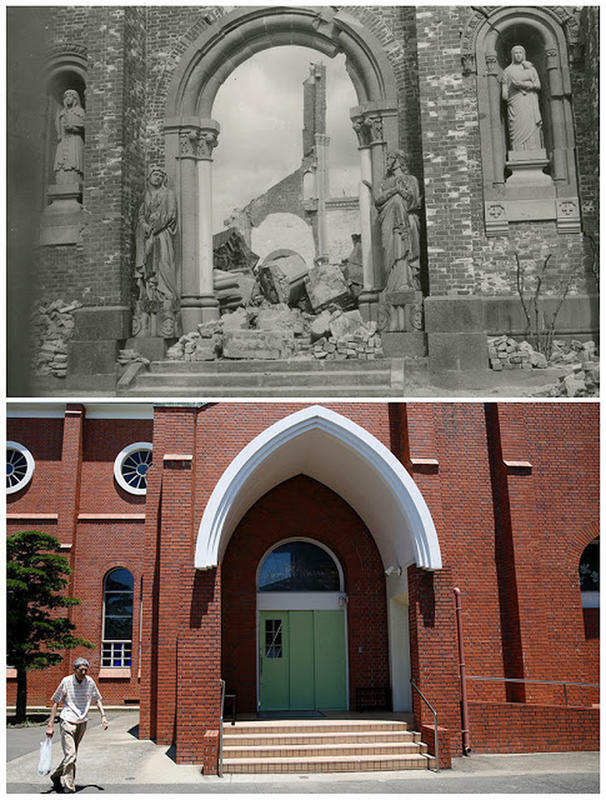 The south face of Urakami Cathedral in 1945 – and the reconstructed cathedral. 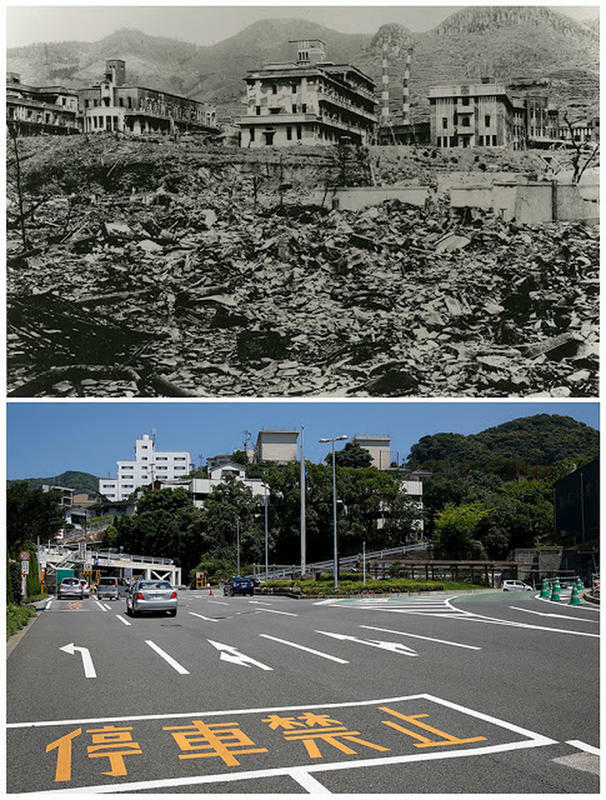 The ruins of the Shiroyama National School in Nagasaki, and the same road we see today.